I sow my garlic in mid to late May, rather than the traditional ‘shortest day’ (mid to late June). I’ve put together some tips for growing your own garlic. Or you can read my article about garlic that appeared in FishHead magazine. How much garlic do you eat in a year? That’s the question you should be asking yourself right now. It’s easy to grow garlic and as you can dry and store it, you can grow enough so you won’t have to buy garlic at all next year. 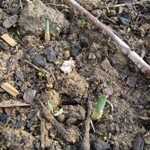 A clove of garlic planted in the soil will grow into a bulb of garlic next year. 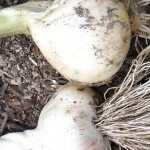 Save the best bulbs to use for ‘seed garlic’ the following season. Try some elephant garlic and some shallots too. Gardeners in New Zealand are often advised to plant on the shortest day and harvest on the longest day. I find I get better growth if I plant earlier (say middle or end of May) and I might not harvest all of it until February the following year. This allows the garlic to get growing well before the soil dries out in summer. Planting garlic to me signifies the start of the new season and the promise of the harvest to come. Garlic likes a moist soil but doesn’t need a very rich soil. I sow mine after a crop of potatoes because the soil is well cultivated from digging them. 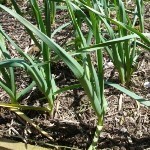 Don’t plant in an area you’ve grown anything from the onion family the year before (chives, onions, shallots or leeks). You can buy garlic heads to sow at the garden centre, farmers’ market or organic supermarket. Choose the biggest bulbs you can. Don’t try planting the bags of Chinese garlic from the supermarket as they will have, by law, been fumigated on import to New Zealand. 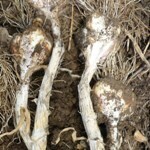 Divide up the garlic bulb into cloves of garlic when you’re ready to plant. Try some elephant garlic if you want big cloves with a milder flavour. Choose the biggest cloves; you’ll probably get about 8-10 from each head of garlic. Break each clove gently off the base of the head of garlic and plant it with the pointy part upwards. Discard any that are mouldy. Make sure that you loosen the soil well and add some lime if your soil is acid. I plant mine so the top of the clove is about 5cm/2″ beneath the surface of the soil. You can plant the smaller cloves close together (2cm/1″) and harvest the green leaves like chives, but I prefer to use them to make pesto or salsa verde. 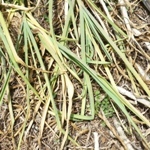 I mulch the whole area after planting with a fine mulch – usually something I’ve shredded in my mulcher, but straw would be ok too. I usually mulch again once the tops are above the ground to avoid too much weeding later on. 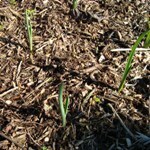 The only care garlic needs is occasional watering and weeding, but I find the mulching makes that much easier. Try digging a bulb at Christmas. Dig gently as the bulbs may be quite deep and if you bruise them they may not keep well. I wait until the tops start to turn yellow before lifting all my garlic and drying the bulbs in a warm, dry, airy place like a shed or garage – usually late January or February. You can plait the stems to hang them up or cut off the tops to about 5cm / 2″ above the bulb and store them in a cool dark place. Some varieties have stems that are easier to plait than others – wet them first to make them more pliable.